There has been a lot of interest in recent times on the perceived benefits of outsourcing as a long term business model. Many organizations have tried offshoring both routine and mission critical processes and the outcome in some cases have been far from satisfactory. A study of 42 companies by leading Australian consultants, A.T. Kearney, looked at the post offshoring operational performance of these companies with a focus on six parameters: capacity, organizational flexibility, revenue performance, organizational capability, process maturity and service levels. The findings of the study reveal that in general there are significant benefits to be achieved from offshoring, but the overall success rate of offshoring strategies vary as widely as 0 to 75%. 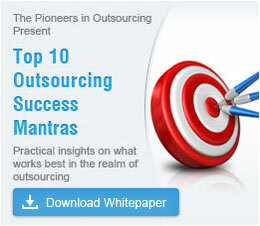 Organizations need to first evaluate whether they actually need to outsource a process at all. Many factors influence this assessment, chief among them being capacity and cost constraints of the organization and the attitude of employees towards offshoring. Often offshoring projects fail because of a wrong assessment of the technical competencies of the vendor. Identifying a vendor with proven expertise, clear performance track record and execution strategies in the outsourced process is crucial to the success of the offshoring project. Creating an internal awareness within the organization on offshoring strategies and sensitizing employees towards the legitimate need for offshoring will be helpful for the management to transition to the offshore model. Companies that have successfully transitioned to outsourced processes vouch for the benefits of offloading select functions and processes to the vendor in a phased-out manner. Right through this transitioning and well into the project life cycle, there has to be a focus on knowledge transfer among teams of both vendor and client and jointly developing a performance strategy. Only after successfully weathering the earlier few steps is it advisable for companies to launch into full fledged offshoring. Even where the company transitions to full offshoring, close tracking of operational performance is a must to ensure that QA checks are in place and that standards are not slipping up. Companies need to look for offshore vendors with high-caliber systems and capabilities that go beyond the "we'll-do-it-all" approach. The focus when searching for an outsourcing vendor should shift to 'performance' and not 'price'. Vendors should focus on specific performance strategies. Effective planning and execution of offshoring projects is critical to delivering value and achieving success in offshoring. Such vendors will even push their clients to optimize their own internal processes and achieve better results in offshoring.